Students have to learn that when they go into the business world, the first impression is what you look like. It might be better to learn right now, from me, rather than when they’re out there hunting for a job. It’s important that standards be set on how young people behave and present themselves. At 91 Mr. Neimark gives lectures to college students. 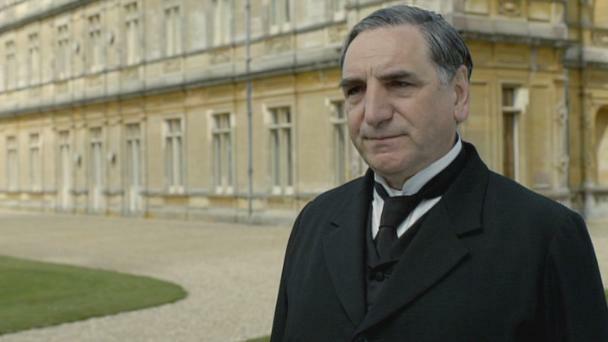 He has one rule for every lecture – no students in jeans, t-shirts or any other sloppy clothing. Mr. Neimark insists young men show up in a shirt, tie, and jacket. Young women also have to step-up their appearance and sport a dress or suit. 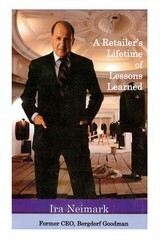 In addition to lecturing Mr. Neimark has written three books on retail business including: The Rise of Fashion, Crossing Fifth Avenue to Bergdof Goodman, and the latest – A Retailer’s Lifetime of Lessons Learned. Breanna Bayba sporting her lovely button handbag. Photo: Richard Aiello. Getting together with the Art Deco Society crowd is always a treat for the eyes with everyone dressed in their vintage best. I particularly enjoy seeing creative combinations mixing decades and perhaps even adding one subtle modern piece. 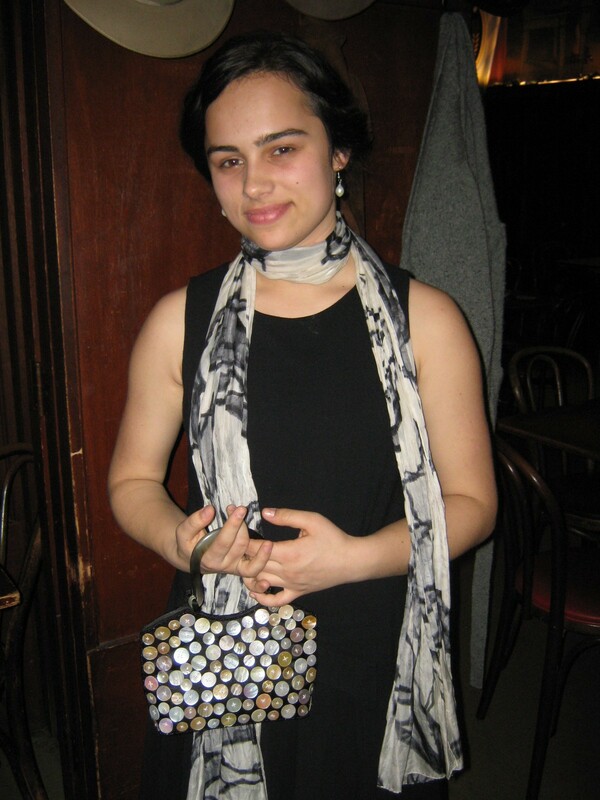 At the recent Art Deco Society of California’s annual membership party (held at Schroeder’s Cafe in San Francisco) I spotted Breanna Bayba looking oh-so 20s chic in a simple drop-waist dress and scarf. What I admired most about her ensemble was a button-clad handbag. 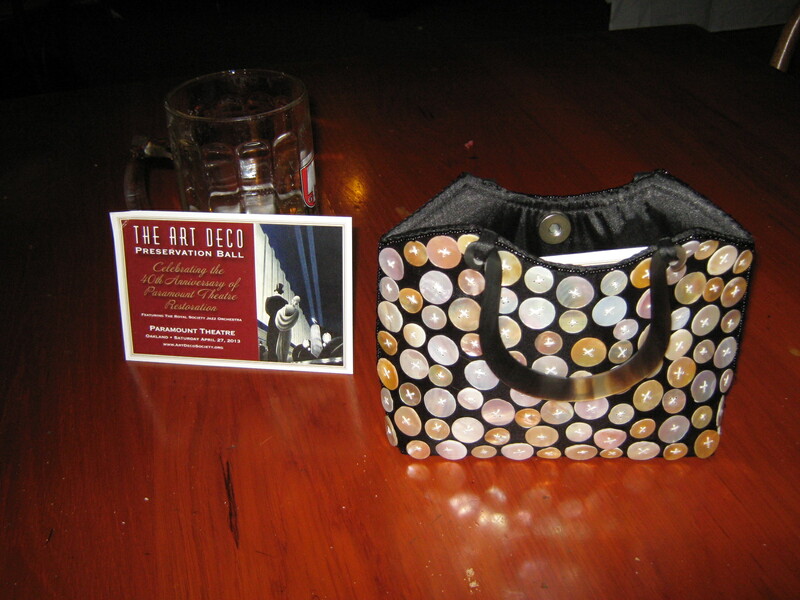 Made of soft fabric, the handbag was covered with various shades of white mother-of-pearl buttons all sewn on by hand. The uniformity of button style keeps the look elegant and timeless, appropriate for a vintage party or a modern wedding. Breanna told me the bag was a gift from her grandmother as she graciously turned it inside out indicating how easy it would be to make. Yes, but I say a lot of work! The buttons are precisely placed on both sides. The use of buttons in this unexpected way gives a spark of individuality to Breanna’s outfit. A woman and her waistline should never be separated. 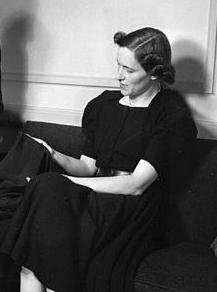 A celebrated designer for Saks Fifth Avenue since 1929, Ms. Gimbel designed Lady Bird Johnson’s red dress-suit for the 1965 inauguration of Lyndon B. Johnson. Neatly written on my London To Do List: Fabric at Liberty London. Located on Regent Street in a 1920s Tutor-revival building, Liberty London is a world-famous department store known for fabulous fabrics. What better a souvenir from my travels than a yard of beautiful fabric? Liberty & Co. was opened in 1875 by Arthur Lasenby Liberty, a former shop manager with a fondness for Eastern arts. Initially Mr. Liberty imported antique furnishings and fabrics but over time demand increased and quality dropped. So, he commissioned London artists to design original furnishings, housewares, and fabrics. Soon Liberty became known for a distinctive style influence by the English Arts and Crafts aesthetic. My search on a cold November afternoon was short and oh-so-sweet. The store was packed with holiday shoppers and tourists but staying focussed, I wove my way up the creaky staircase to the third floor where I met an abundance of fabrics. I knew I wanted something simple with a color combination suitable for year-round wear. A lot of the selection was floral and paisley patterns in a bright palette. I circled once, twice and on the third round I chose a lovely cotton floral in orange and grayish black (pictured above). Now my fabric is in the hands of the very talented designer/seamstress, Theresa LaQuey. Working her magic (and sewing machine) Ms. LaQuey is creating a vintage-style button down blouse. I’m also having made a pair of 1930s style wool pants (fabric bought at Stonemountain & Daughter) to complete the outfit, which I’m calling The Londoner. 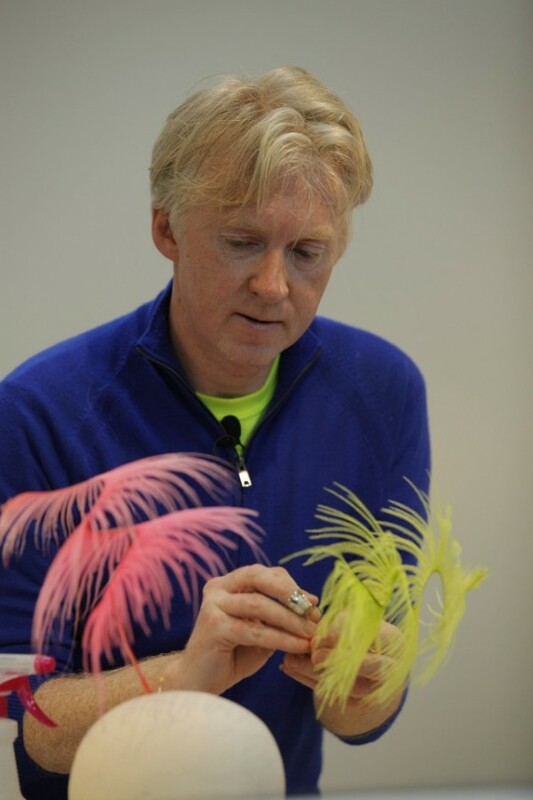 There is a couture audience for exquisite and unusual things. Today, people are much more interested in things made especially for them, at a time of a ‘McDonald’s-ization’ of luxury. Image courtesy of Viking Press. We all put obstacles in our own path toward personal style, myself included. If we understood why we constructed these practical and emotional obstacles, we might move beyond them to healthier, happier perceptions of ourselves and, ideally, a better sense of self-esteem. Style can change your look, certainly, but it can also change your life. In The Truth About Style Ms. London profiles nine women who are in fashion ruts- with-a-cause. For example, 19-year-old Ashley had developed an eating disorder after a romantic break-up and with the weight gain she lost her sense of style. Ms. London identified Ashley’s underlining cause as: emotional strength sapped by two years of an eating disorder. At age 57, June was having a hard time shifting from a youthful look to something more mature. Her underlining causes according to Ms. London: facing getting older, frustration with fewer shopping options for women her age, and mourning the end of cute. After identifying each cause, Ms. London moves on to helping these women see themselves differently by putting together chic and appropriate looks just like she does with co-host Clinton Kelly on the popular television show What Not to Wear. The book is loaded with before and after photos as well as a discussion about why her choices work. 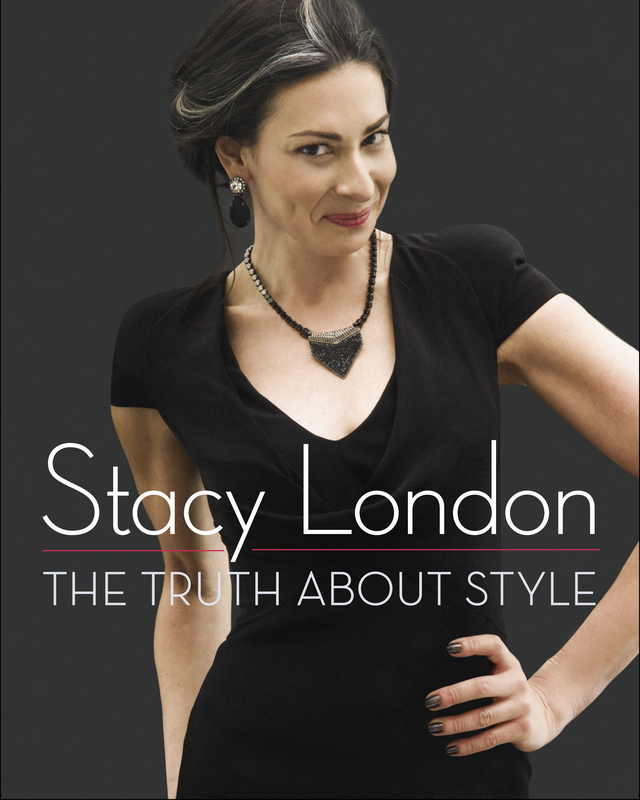 What makes The Truth About Style different from other fashion guides is that Ms. London delves into some of the reasons behind style ruts, much like Suzie Orman does for financial issues. Additionally, she discusses her own life facing psoriasis as a child, an eating disorder, and life as a forty-something single woman. Ms. London’s writing style is professional and succinct, although her constant attempt to be humorous and parenthetical asides are distracting. Still, I enjoyed the read and would recommend it to women who are looking for some style assistance as well as design students, who could learn a lot from this book about what fashions work for real women. If you’re tired of style, you’re tired of life.